Fospan Worldwide is a Dutch-Spanish solution provider for the horticulture and specialized in the medicinal cannabis industry with many years of cannabis experience. Zuri, Fospan CEO, points out that “One of the most crucial issues in starting a horticulture business, is to look for and rely on specialized companies and products that aim at supporting growers in being successful”. According to him, most of the time, setting up a growing facility reveals itself to be trickier than initially expected. “Growing cannabis, especially in large scale operations, demands knowledge on what is available on the market. In the recent past, a lot of starting growers jumped into the cannabis industry based on experience gained in small-scale operations from the days where cannabis was mainly cultivated for own usage”, explains Zuri. For Fospan worldwide it has always been important to be a developing company whose mission is to support growers in being successful. “We help growers with their projects in every possible way. From designing complete facilities, advising or providing growing systems, custom-built aquaponic, aeroponic, natural substrates and hydroponics systems and equipment up to providing Magnus light (Fospan’s brand LED) solutions. But also our Optimus specialty substrates, nutrients and exclusive CBD seeds and award winning Sumo seeds are part of our portfolio”, says Zuri. Differently from traditional horticulture, cannabis greenhouses need a more careful management of lighting and, as a result, of climate control, especially with regards to the compliance with pharmaceutical standards. Zuri mentions “There are many fields in which we support our customers. A good example is the lightning which is needed in a farm. We were recently informed that the Danish agency responsible for licensing medical cannabis producers issued regulations on lamps that are allowed to be used. Apart from requirements like easily cleanable (for active cooling, no fans and for passive cooling, no cooling fins) and made from non-toxic materials, the output must be of high quality to ensure that yields and cannabinoid profiles are consistent. Further it is mentioned that the luminaires and parts must be of high quality so that their light output and spectrum does not decay quickly, dramatically affecting the yields. This also concerns the wavelength distribution of the spectrum which must remain without significant changes throughout the luminaires’ lifespan to ensure consistent yields and cannabinoid expressions”. Zuri is more than happy that Magnus Lights anticipated on such regulations. “These are examples where our experience and partnerships played a major role” he says. 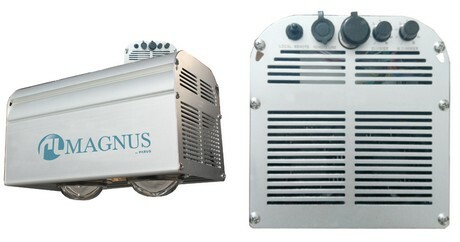 Fospan worldwide developed water-cooled Magnus LED (100.000 light hours = 22 years of flowering) specifically for the medicinal cannabis industry and GMP standards. “For instance, some positive points are that the fixtures are totally closed, made of full aluminum parts and available in different wattage, voltage or type fixtures like linear or COB top-lights. The lights are developed in close collaboration with Parus who is one of the leading horticulture LED manufacturers in the world. To underline the quality and durability of the LED’s manufactured by Parus: in a project for the largest Russian lettuce producer which they installed in 2008 has not occurred a single LED fail or output decay until today”, he explains. One of the pressing problems within this industry is the lack of a common knowledge that everyone can resort to. “There are so many products and there is so much information published – which is also an indication of how this industry is blooming. At the same time, it is hard for growers to understand what the best way to do things is, and who and what to rely on”. Zuri reacts to those development saying: “That is why we prefer to be completely honest to our clients, and share our experiences and everything we know about this industry with them – as we have been in this business for over 17 years and love what we are doing”. According to him, Magnus Light solutions are a solution for both for the vegetative as well as the flowering state. Additionally, Magnus Light solutions support growers in keeping the growing facility as cool and efficient as possible: “We indeed offer lights with a water-cooling system, thus reducing the heat generated up to 20%” not even to mention that this effects also the lifespan positively. “Through Fospan Worldwide, we try to help growers in every possible aspect of their cannabis projects. For instance, we can supply them with genetics. Our strain portfolio is very diverse, from high THC/low CBD, to high CBD/low THC. With regards to our specialty substrates Optimus portfolio, we can, if requested, provide a made-to-measure mixture for a client who has already a personal mixture in use”. 2019-04-16 "Merging cannabis with the horticultural world is the big key"
2019-04-12 “Growing cannabis in large-scale operations demands knowledge"